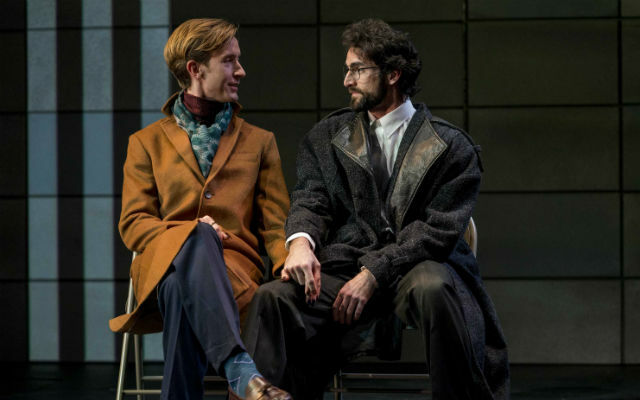 True confession: I’ve always thought that “Millennium Approaches,” Part 1 of Tony Kushner’s magnum opus, “Angels in America,” was a bona fide work of genius. But Part 2, “Perestroika,” always seemed a lesser effort, more overstuffed with ideas and philosophical disquisitions, more rambling and loquacious. But at Cygnet Theatre, under the masterful and imaginative direction of Sean Murray, with all its depth, expanse and complexity, Part 2 is as resplendent and unforgettable as its predecessor. I’ve already written about the magnificence of Part I. You can actually see them both in one day, though the opening nights were scheduled almost two weeks apart. These characters are so vivid, so wonderfully portrayed, that they, their journeys and their stories will stay with you for a good long time; a time lag between the parts will not stress or strain the memory. But you must see them in sequential order. This epic story covers a lot of ground: the AIDS crisis in the 1980s Reagan administration; fiendish lawyer Roy Cohn, a gay-bashing homosexual and anti-Semitic Jew, and his acolytes and nemeses (including Ethel Rosenberg, whom he proudly sent to the electric chair in 1953 as a Commie spy); a closeted Mormon and a cowardly gay man who abandons his AIDS-suffering lover; mental illness; fantasies, angels, and so so much more. The malevolent, manipulative fixer, Cohn, a protégé of the Red-baiting Sen. Joseph McCarthy (and a mentor to Rupert Murdoch, Roger Stone … and Donald Trump). In Part 2, we see Roy flaunting his evil; and (bring on the schadenfreude! ), we watch him succumb to AIDS, while lying that it’s liver cancer. James Newcomb, a gifted actor who started Roy out on a somewhat subdued note in Part I, really takes him on a journey to hell in Part 2: railing, ranting, swearing, and debasing everyone in sight. Newcomb goes to a dark place, and makes Roy into the hateful bigot the world came to loathe — a man who, right before his death, lost everything he had built up over decades when he was disbarred. Ethel Rosenberg returns to haunt him, and relishes being the one to tell him he’s no longer a lawyer. For one nanosecond, in the midst of his pain and agony, we almost have a bit of sympathy for him and his horrible death. But then, he shows his true villainous, barbarous colors once again, and the world is restored to equilibrium. Meanwhile, his “Roy-Boy,” Joe Pitt (anguished Connor Sullivan), the devout Mormon struggling with his homosexual desires, abandons his wife, Harper (who’s struggling with her own mental health issues), and takes up with Louis (deliciously neurotic Wil Bethmann), the hyper-analytical, hyper-verbal Jewish deserter of Prior (superb Alex Bodine, wryly funny, deeply pained, splendidly flamboyant). Prior who, like Harper, has a kind of visionary acumen (their shared “threshold of revelation”), has been chosen by the Angel as a Prophet, selected to single-handedly avert a cataclysmic apocalypse by forcing the human race to slow down, and not move, change or progress. In Part 2, Prior makes an ascent to heaven and meets the dull, inert, unimaginative Angels who have been abandoned by God and have no clue what to do. And then there’s the historical diorama at the Mormon Visitors Center in New York. Funniest incarnation of that scene I’ve ever witnessed. 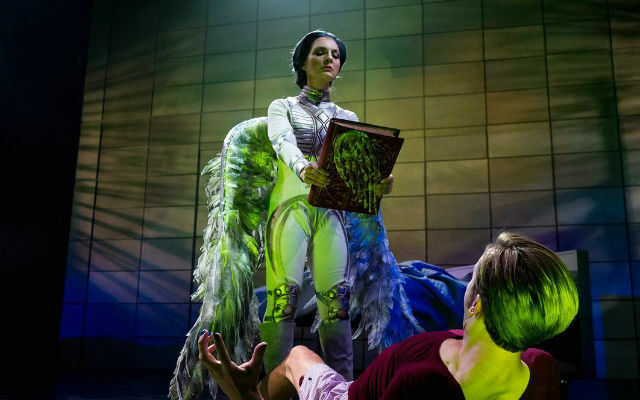 The emotions are heightened, the technical work is superlative (Andrew Hull’s set; Chris Rynne’s lighting; Steven Leffue’s sound; Peter Herman’s wigs; Shirley Pierson’s costumes). The cast only gets better, deeper, more multifaceted from Part I to Part II. Rosina Reynolds is marvelously still and centered as Ethel Rosenberg and impressively practical and down-to-earth as Hannah Pitt, who ends up indirectly encouraging Harper (a wonderfully loopy but clear-sighted Rachael van Wormer) to leave her husband, and becoming a savior of sorts to the ailing Prior. As the gay nurse, Belize, excellent Kevane La’Marr Coleman gets his drag on, and also goes head-to-head with Roy. It’s wonderful to behold; the power differential has shifted, and the black man holds all the cards – not to mention the life-sustaining AZT drugs. At the outset of Part 2, we meet The Oldest Living Bolshevik (who describes ours as a “sour little age”), and we hear all the politics, theory and philosophy Kushner has been ruminating about his whole life. By the end, there is, I suppose, a perestroika (a term coined during the days of the Soviet Union, referring to re-structuring and re-forming the system). There are changes and re-groupings, and there’s a modicum of hope. Yet, in the 25 Years since the play(s) first premiered, we haven’t come very far. People with AIDS may be living longer, but gay men are still getting beaten up, Roy’s Boys are alive and well in our government, and things aren’t exactly in a forward-looking place in America. We keep moving, but not always ahead. Perhaps it’s time for another visit from the Angel. In the meantime, you can do your part. See this two-part phenomenon. You’ll be informed, edified, enlightened and amused. Duration is not an issue. Treat yourself to a heart-stopping experience. The show plays in rotating rep with “Angels in America, Part 1: Millennium Approaches,” through April 20. The parts should be seen in sequence. Running time: 3 hr. 45 min.